@Joo Chiat | Get Your Grub On! New Mexican in the East. Mexican places are popping up all over town and my mates and I give our best to try them all. This was also the reason why two of us went all the way to East Coast Road to checkout the fairly new ‘Lower East Side Taqueria’. Imagining the usual corn tacos, I’m used to, I ordered three different types off their menu but little did I know they all came in huge and fried taco shells. First I tried the ‘Hake‘ (right) and the generous portion of fish fillet was soft, pretty tasty and not too fishy but unfortunately also almost unrecognisable between the creamy slaw and guacamole. Both of which tasted good but there was just too much going on to really honour the fish itself. I didn’t like the fried tortilla, it was too big and greasy and extremely filling rather than just the vessel for the toppings. Continuing with the ‘Chorizo Taco‘ (left) which tasted more like a creamy version of chili con carne but had good flavours to it. The sausage mix was bedded on a layer of basmati rice which felt a bit out of place especially because this taco used the same fried and filling shell as the first one. The last taco I had was the ‘Pork Belly‘ (top) which reminded me much more of slow cooked, juicy pulled pork than the braised fatty pork belly I had expected but it was delicious anyway, rightly sized and to my delight came in an ordinary hardshell taco basket. The sweet corn and pineapple salsa underneath added some nice crunch and sour-sweetness to it all so this one actually worked pretty well for me. The place is in a good location for people living around the area sitting in a row with all the other hundreds of East Coast restaurants and the open face facade and outside seating seem inviting particularly for sunny days like today. 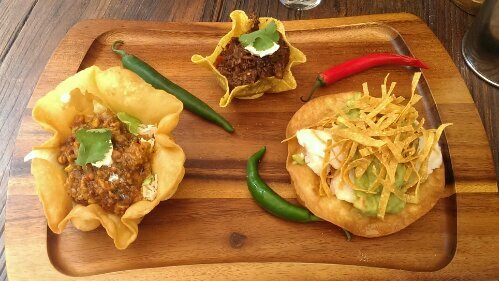 The presentation of the food is done right but tastewise I was a bit disappointed as I had expected some soft or hardshell tacos rather than these massive fried tortillas that made me feel unpleasantly stuffed and generally there were just too many flavors in each dish for me. The universal idea is not bad though and playing with the ingredients can turn out great, like proven by the pork belly taco, but for now I won’t be venturing too far East to get my Mexican on.